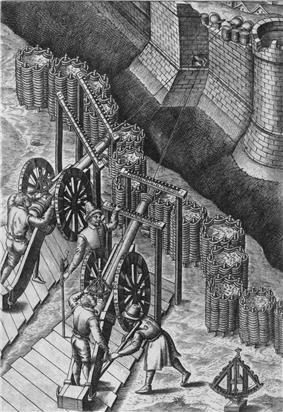 Gabions with cannon, from a late 16th century illustration. Up close view of a bank protection made with mattresses in Vrtižer, Slovakia. A gabion (from Italian gabbione meaning "big cage"; from Italian gabbia and Latin cavea meaning "cage") is a cage, cylinder, or box filled with rocks, concrete, or sometimes sand and soil for use in civil engineering, road building, military applications and landscaping. 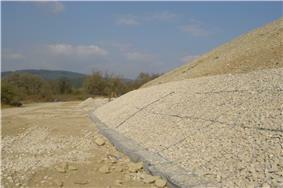 For erosion control, caged riprap is used. For dams or in foundation construction, cylindrical metal structures are used. In a military context, earth- or sand-filled gabions are used to protect artillery crews from enemy fire. Leonardo da Vinci designed a type of gabion called a Corbeille Leonard ("Leonard[o] basket") for the foundations of the San Marco Castle in Milan. The most common civil engineering use of gabions was refined and patented by Gaetano Maccaferri in the late 1800s in Sacerno, Emilia Romagna and used to stabilize shorelines, stream banks or slopes against erosion. Other uses include retaining walls, temporary flood walls, silt filtration from runoff, for small or temporary/permanent dams, river training, or channel lining. 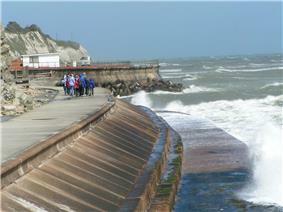 They may be used to direct the force of a flow of flood water around a vulnerable structure. Gabions are also used as fish screens on small streams. Gabion stepped weirs are commonly used for river training and flood control; the stepped design enhances the rate of energy dissipation in the channel, and it is particularly well-suited to the construction of gabion stepped weirs. A gabion wall is a retaining wall made of stacked stone-filled gabions tied together with wire. 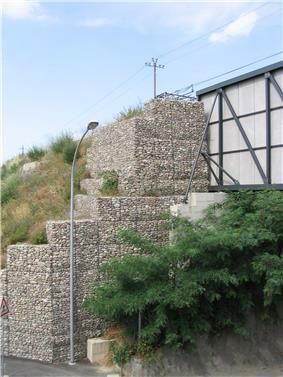 Gabion walls are usually battered (angled back towards the slope), or stepped back with the slope, rather than stacked vertically. Gabion baskets have some advantages over loose riprap because of their modularity and ability to be stacked in various shapes; they are also resistant to being washed away by moving water. Gabions also have advantages over more rigid structures, because they can conform to subsidence, dissipate energy from flowing water, and drain freely. Their strength and effectiveness may increase with time in some cases, as silt and vegetation fill the interstitial voids and reinforce the structure. 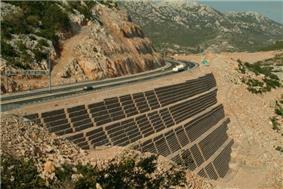 They are sometimes used to prevent falling stones from a cut or cliff endangering traffic on a thoroughfare. The life expectancy of gabions depends on the lifespan of the wire, not on the contents of the basket. The structure will fail when the wire fails. Galvanized steel wire is most common, but PVC-coated and stainless steel wire are also used. PVC-coated galvanized gabions have been estimated to survive for 60 years. Some gabion manufacturers guarantee a structural consistency of 50 years. In the United States, gabion use within streams first began with projects completed from 1957 to 1965 on North River, Virginia and Zealand River, New Hampshire. More than 150 grade-control structures, bank revetments and channel deflectors were constructed on the two U.S. Forest Service sites. Eventually, a large portion of the in-stream structures failed due to undermining and lack of structural integrity of the baskets. In particular, corrosion and abrasion of wires by bedload movement compromised the structures, which then sagged and collapsed into the channels. Other gabions were toppled into channels as trees grew and enlarged on top of gabion revetments, leveraging them toward the river channels. Gabions have also been used in building, as in the Dominus Winery in the Napa Valley, California by architects Herzog & de Meuron, constructed between 1995 and 1997. The exterior is formed by modular wire mesh gabions containing locally-quarried stone; this construction allows air movement through the building and creates an environment of moderate temperatures inside. Bastion: a gabion lined internally with a membrane, typically of nonwoven geotextile to permit use of a granular soil fill, instead of rock. Mattress: a form of gabion with relatively small height relative to the lateral dimensions; commonly very wide. For protecting surfaces from wave erosion and similar attack, rather than building or supporting high structures. Trapion: a form of gabion with a trapezoidal cross section, designed for stacking to give a face that is sloping rather than stepped. The term is in wide usage, but in contexts related to gabions at least, appears to be a trademark registered by Betafence Limited. In the medieval era, gabions were round cages with open tops and bottoms, made from wickerwork and filled with earth for use as military fortifications. These early military gabions were used to protect field artillery gunners. The wickerwork cylinders were light and could be carried relatively conveniently in the ammunition train, particularly if they were made in several diameters to fit one inside another. At the site of use in the field, they could be stood on end, staked in position, and filled with soil to form an effective wall around the gun. Today, gabions are often used to protect forward operating bases (FOBs) against explosive, fragmentary, indirect fires such as mortar or artillery fire. Examples of areas within a FOB that make extensive use of gabions are sleeping quarters, mess halls, or any place where there would be a large concentration of unprotected soldiers. University of New South Wales Water Research Laboratory, Research Report No. 156, "Some factors affecting the use of Maccaferri gabions and reno mattresses for coastal revetments", October 1979, C. T. Brown, et al. ^ "Gabions (in small-scale construction or hard landscaping)". Paving Expert. Retrieved 2015-05-06. ^ "Feature Projects - Project 2". gabions.net. Retrieved 22 November 2014. ^ Toblaski, R.A., and N.K. Tripp, 1961. Gabions for stream and erosion control. Journal of Soil and Water Conservation 16: 284-285. ^ "Dominus Winery in Napa Valley, California, USA.". floornature.com. Retrieved 2009-02-22. ^ "Dominus Winery". Archiplanet. Retrieved 2009-02-22. Freeman, Gary E.; Fischenich, Craig J. (May 2000), "Gabions for Streambank Erosion Control", Environmental Laboratory, U.S. Army Corps of Engineers.